With millions of people around the world suffering from back pain, is there any hope for relief outside of traditional methods? Low back pain can be excruciating and immobilizing, but there is still hope. When dealing with any pain or injury, exercising might be the last thing that crosses your mind, especially if it’s chronic low back pain (CLBP). However, that’s exactly what is recommended and what can help. Research is revealing that people who exercise and stay flexible are better able to manage pain than those who are sedentary. So my charge to anyone reading this, whether or not you are living with low back pain, stay proactive and make health and fitness a priority. Rather than be forced into reacting to an injury that might have you sidelined for months, take a step toward low back pain relief. Alarming statistics reveal that the single leading cause of disability globally is none other than low back pain. 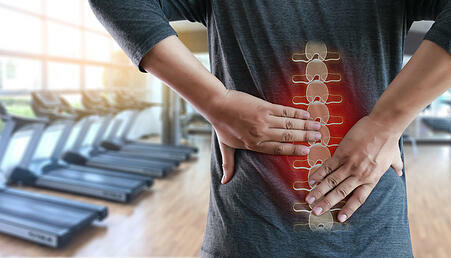 According to the American Chiropractic Association, “Back pain is experienced by 31 million people at any given moment.” After all, it is the third most common complaint during doctor visits and accounts for more than 264 million lost work days annually. Fortunately, there are several precautionary steps that you can take to prevent low back pain episodes as well as further injury. Keep in mind that humans are complex beings and it is important to address overall health. Start and maintain an exercise program. Our NIFS staff can work individually with members to develop a proper strength-training program that addresses cardiovascular fitness as well as flexibility and mobility. Maintain a healthy weight. According to the National Arthritis Foundation, “Every pound of excess weight exerts about 4 pounds of extra pressure on the knees.” Therefore losing a few pounds can take pressure off the back and knee joints. Limit and manage stress levels. Paying attention to stress levels can help you avoid behaviors that lead to obesity such as overeating and a sedentary lifestyle. If stress levels stay low, it can help improve overall health. Always keep in mind that we are complex beings and it is important to address our overall health needs. It might take multiple methods to address back issues, but why not jump ahead and try to prevent them through proper health and wellness strategies? Visit www.nifs.org to find out more information, see the up-to-date Group Fitness Schedule, and start your fitness journey now. This blog was written by Cara Hartman, NIFS Health Fitness Instructor. To find out more about the NIFS bloggers, click here.